No wonder this hard to reach population is called to be one of the unhealthiest in the US. Read more from Stewart Levy, CEO of HealthWell Solutions on safety, barriers and solutions to support trucking fleets and improve driver`s health. What can Drivers do for their own Health? What can Organizations do to support their drivers and promote employee wellness? To improve your health, you must take notice of the decisions you are making and understand what is influencing them. To make healthy decisions, you need to understand what that means. Check out the DrivingHealthy Resources. Now it’s time to create an action plan! Set your own reachable goals, track your progress and sustain your success by monitoring it. HealthWell Solutions is a health management company that provides customized corporate health and wellness solutions to drive successful health outcomes. Learn more and contact us today:http://healthwellcorp.com or info@healthwellcorp.com. (1) AllTrucking. Truck Drivers in the USA. http://​www.alltrucking.com​/​faq/​truck-drivers-in-the-usa/​ (accessed November 16, 2017). (2) NIOSH. 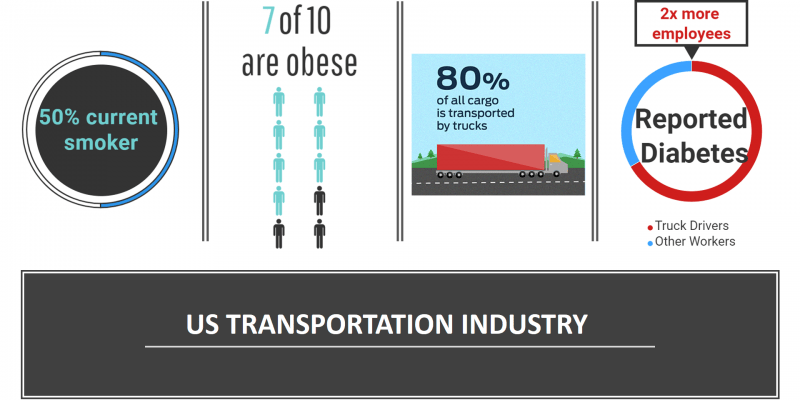 LONG-HAUL TRUCK DRIVERS: Health. https://​www.cdc.gov​/​niosh/​topics/​truck/​health.html (accessed November 13, 2017). (3) Transporation.gov. New Hours-of-Service Safety Regulations to Reduce Truck Driver Fatigue Begin Today. https://​www.transportation.gov​/​briefing-room/​new-hours-service-safety-regulations-reduce-truck-driver-fatigue-begin-today. (4) Springer, B.; Petrancosta, B. Wellness Coaches USA and Con-way Freight Design Effective Wellness Program to Improve Health, Wellness, and Safety of all Conway Employees; Maryland, 2010.